Get away from it all. Les Parillers is as rural as it gets but still only half an hour from the bright lights of three cities, Angers, Le Mans and Tours. This beautiful property is set in almost 5 acres of parkland with it's own exclusive private pool. Dating back to the sixth and tenth century and still retaining some original features and charm but with all the convenience of modern living to ensure your holiday is special and memorable. The house is a longere or long house, so you are welcomed into the Kitchen and from there into the Lounge and the bedrooms on down the length of the house. The Kitchen is rustic, warm and comfortable as the heart of the home should be. The gathering place for leisurely breakfast or night cap before bed. It is generously equipped and stocked. Relax in the lounge with a cosy wood burner for those early spring or winter breaks. There is gas central heating to ensure an ambient temperature all year round. Satilite TV with English channels will ensure you don't miss your favourite Soaps. Perfect for a family get together, a group of friends or romantic hideaway. Enjoy a quiet moment amid wild life of birds and squirrels or visit one of many local attractions. Two villages, Precigne 2 miles and Notre Dame du Pe 1.5 miles. The bigger of the two is Precigne and you will find almost everything here on a small scale. The church of St Menele is just across the field. Electric fan oven with spit roast and timing functions. Tea, Coffee, salt, pepper, cooking oil and lots more. parchment cooking paper, tinfoil, cling wrap and paper towels are also left for you to use and replace with similiar when there gone. Generously stocked so that there are plenty even when the house has eight people staying. Large open plan kitchen dining area. Well equipped with all modern conveniences. Dining can be in the Kitchen which will comfortable seat 8 or in the lounge the dining table can seat 6. There is also plenty of garden furniture and space to enjoy dining outside. over 30 golf courses with one hours drive of the house. This property is all ground floor level with only two internal steps. Gravel surface outside. May suit clients with limited mobility. The Loire Valley, the playground of Kings and one of the most beautiful areas of French countryside. 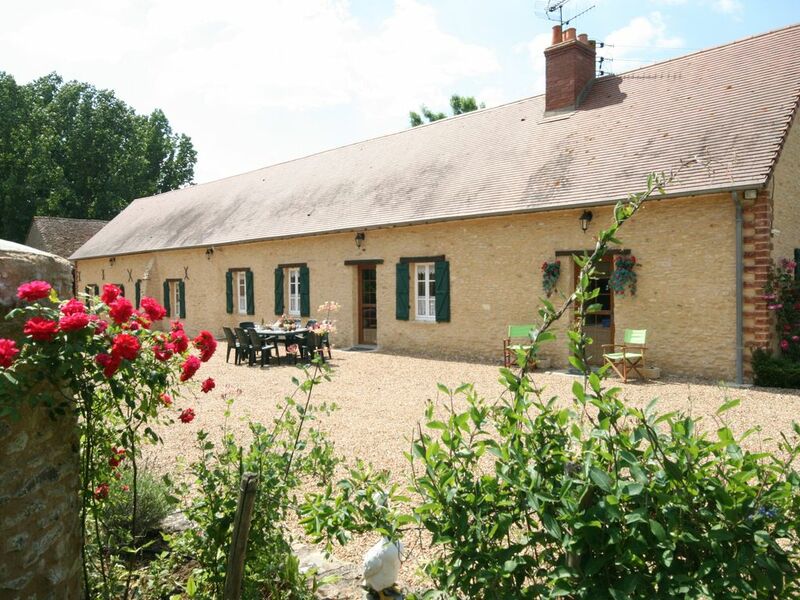 Les Parillers is ideally situated in the middle of five cities, Angers, Le Mans, Nantes, Saumur and Tours are all worth a visit and are all within very easy reach of Les Parillers. In 2000 UNESCO added the Loire River to it's list of World Heritage Sites. It is one of the world's most well known wine regions and includes Muscadet, Sancerre, Pouilly Fume, St Nicholas de Bourgeuil, Chinon and Anjou are some of the most notable. There is plenty to do and see, but you may want to just relax and enjoy the peace and tranquillity of the beautiful park with lots of wild life, the pool in the sunshine all day and the home comforts of the house. Discount available for bookings of 14 nights or more Pets are welcome to stay at the property, they must be booked and in advance and guest must agree to terms of acceptance. No Charge will be made for cleaning provided the house is left clean and tidy at the end of the holiday. Late departure penalty applies. Electricity is included. Bedlinen and towels are provided.